There are indications that the faction of the Enugu state chapter of the Peoples Democratic Party, PDP, led by the Enugu State Governor, Sullivan Chime may have lost the battle to control the party in the state as a Federal High Court sitting in Abuja recently upheld the November 1, 2014 Ward Congresses conducted by the Enugu State PDP. Governor Chime has been in a running battle with some prominent members of the party, including the Deputy Senate president, Ike Ekweremadu and Former Governors. The position of the court was made known by Justice A.F.A. Ademola while ruling on a suit filed by the plaintiff, Mr. Orji Chinenye Godwin, Chiefs Cletus C. Akalusi and Orji Orji on behalf of themselves and all delegates elected on November 1, 2014 Ward Congresses with the PDP national chairman and the national organizing secretary as well as the Independent National Electoral Commission (INEC) as defendants. The ruling came as Justice A.R. Ozoemena of the Enugu state High Court withdrew from hearing the suit (NO. E/439/2014) brought before him by a member of the party in the state, Chief Ikeje Asogwa, praying the court to uphold his purported appointment as the chairman of the Enugu State chapter of the PDP and also restrain the defendant, Acting Chairman of the Enugu state chapter of the PDP from parading himself as the chairman of the state PDP. The plaintiffs in the case heard by the Federal High Court, Abuja, had, among others, sought the declaration by the court that the list of delegates is the only valid list for the PDP delegates for primaries in Enugu State to the exclusion of all other lists. It also sought an order restraining the INEC from accepting any other list of delegates for the PDP primaries in the state. Ruling in the suit, Justice Ademola held that a valid ward from the 260 Electoral Ward Congress for the election of three man delegate of Enugu State took place in Enugu state on November 1, 2014 and that the list before it remained the valid list of candidates returned at the election. On their part, the defendants had raised the issue of Jurisdiction of the court contending that the suit dealt with internal matters of the PDP. The court, however, held that it had jurisdiction to hear the suit because the matters in contention were not simply the internal matter of the PDP. It also held that the delegates had been duly elected, have certain rights, and could therefore ask the court to protect their rights as delegates. Justice Ozoemena could not proceed with ruling on Motion on Notice at the Enugu State High Court in the suit brought by Chief Asogwa challenging the claim to the chairmanship of the Enugu State chapter of the party by the state Deputy Chairman, Elder David Aja. Justice Ozoemena had on November 14, 2014 taken full arguments on the Motion on Notice and adjourned the matter for November 24 for the ruling of the court. But when the case came up for ruling the learned Judge told the court that he had been receiving “threat calls and messages on his phones” and could therefore not go on with the case. While lawyer to Asogwa, Mrs. Offia (SAN) described the scenerio as unfortunate, counsel to the defendant, Mr. Ogochukwu Onyekwuluje, held that the proper thing to do was for the learned Judge to petition the police and make available to them the phone numbers in question for thorough investigations that would bring the culprits to book. However, withdrawing himself completely from the case, Justice Ozoemena held that the file be returned to the Registrar of the Enugu State High Court for onward transmission to the Chief Judge of the Enugu State High Court, Justice Innocent Umezulike, for reassignment. It could be recalled that while arguing the Motion on Notice on November 14, counsel to Aja had challenged the jurisdiction of the court to hear the case as the matter was a subject of an ongoing litigation at a court of coordinate jurisdiction. He had urged the court to strike out the suit on grounds of abuse of court process. In a related development, a Federal High Court sitting in Abuja presided over by Justice E.S. Chukwu had declared Elder David Aja as the authentic chairman of the Enugu State chapter of the PDP, pending the appointment of another chairman from the area (Enugu North Senatorial Zone) where the immediate past chairman of the party Engr. Vita Abba hails from. Justice Chukwu, while delivering judgment in the suit filed by Elder Aja on October 27, 2014, granted all the reliefs sought by the plaintiff. The defendants in the suit were Peoples Democratic Party, its Chairman, Alhaji Adamu Muazu, Independent National Electoral Commission, INEC, Chief Ikeje Asogwa and Steve Oruruo. The Court declared that following the resignation of Vita Abba as the chairman of the Enugu State chapter of the 1st Defendant, PDP, the plaintiff as the Vice Chairman of the said chapter was entitled to act as chairman of the 1st Defendant pending the appointment of another chairman from the area Abba hails from. Ruling Justice Chukwu ordered that “the 4th Defendant (Ikeje Asogwa) is not entitled to hold himself out or perform the function of the chairman of the Enugu State chapter of the 1st Defendant not have been validly appointed. He also ordered the setting aside of all acts performed by the 4th Defendant purporting to act or carry out the functions of the Chairman of the Enugu State chapter of the party. Meanwhile, in an amended affidavit in response to the originating summons in the case filed in a Federal High Court, Abuja, by the delegates elected at that congress, to safeguard the result of the congress, the PDP counsel, Olisa Overrode his earlier submission and held that there was congress in Enugu State as reported by the Electoral panel sent to conduct the congress. He said as of November 12, 2014, when he filed his earlier claim that there was no congress in Enugu State, he was not properly briefed partly because the report of the congress was still being compiled and analyzed by the office of the National organizing secretary. He further explained that he was misled at the time of filing his earlier affidavit by a supervisor in the department of organization and mobilization into believing that there was no congress, but who as it had turned out did not have credible information. He added that in a table attached to the amended affidavit showing states where congresses held to elect the ad-hoc delegates on November 1, 2014, Enugu was featured as number 19. “Ward Congresses for 3 Ad-Hoc Delegates Analysis of Reports/results sheets” and signed by the National organizing secretary, Abubakar Mustafu, the table provides the analysis of congresses in 34 state including Enugu. “In compliance with the timeline (time table) for congresses/primaries’ leading to the 2015 General Elections, Ward Congresses for the election of 3 Ad-Hoc Delegates were conducted in 34 states and the FCT on November 1, 2014,” the National organizing secretary said in the table. However, the battle between Chime and Ekweremadu may have reached a level of no compromise as the recent truce brokered by President Goodluck Jonathan, Adamu Muazu and other party stakeholders had failed. It was gathered that in the said peace meeting which was held at the Aso Rock Villa, Abuja, the President told Chime to allow Ekweremadu to go to the senate while he (chime) should produce his successor and other major elective positions in the state. The governor is said to have lost out at the negotiation table owing to his loss of the State’s party structure to Ekweremadu at the last Ward Congress. Meanwhile the governor said recently that the PDP in the state would not be intimidated into abandoning the implementation. AMEN SuperNews gathered that the governor’s set back started when he abandoned some prominent party leaders like former National chairman of the party, Dr. Okwesilieze Nwodo; Senator Jim Nwobodo; former senate President Ken Nnamani and others possibly because of their interests. According to source these leaders who had joined Ekweremadu had vowed to see that Chime and his endorsed candidates lose out completely on the forthcoming PDP primaries. However, Chime had said that the PDP in the state would not be intimidated into abandoning the implementation of zoning policy in the distribution of elective positions in the state, insisting that it was the party to beat in the 2015 general elections. The governor, who spoke while addressing a crowd of stakeholders in Enugu, reiterated that the party remained the only viable vehicle to elective offices in the state, arguing that anyone who chose to leave the party was seeking his own retirement from politics. He stressed that zoning and consensus buildings were entrenched in the party’s constitution and had been successfully practiced in the state since the inception of his administration. Chime, noted that the seeming crisis within the party in the state was rooted in the refusal of some prominent members of the party seeking elective offices to comply with earlier agreements reached merely for their own selfish ends. “What guides us in Enugu state is that we ‘have discarded the idea of godfatherism and imposing candidates on our people. We have always, through consultation, chosen those to fly our flags of elections. And because we have always consulted widely, we usually triumphed. I want to reassure all our people that PDP Enugu State chapter will triumph again in the 2015 general elections. “The PDP in Enugu state has remained strong and united despite the current challenges because of your commitment, your discipline and determination to ensure full compliance with our rules. You are all witnesses to the abuses and insults I have been personally subjected to because of our insistence that our brothers and sisters should do the right thing by complying with agreements long reached. But I’m not deterred. That will not change my ways because nobody can intimidate us to abandon what is right. Referring to the controversy surrounding the deadlocked ward congresses of the party in the state, Chime noted that the PDP in the sate stood in unison against the attempt by some people to fake the exercise and will continue to insist that the proper thing be done. “We must be allowed to choose our leaders. In the face of unwarranted provocation and abuses from these persons, all we offer them are our prayers. Our collective decision as you have amply demonstrated today is that the right thing be done and I will take this decision to wherever we are called. This is not the time for anyone to intimidate or cow our people”. Consequently, the PDP State Working Committee (SWC) petitioned the national leadership of the party on the activities of the Acting Chairman, Aja. The 12 members out of the 14 man state working Committee members were angry over what they described as “the untoward act of conspiracy and gross misconduct exhibited by the state Deputy Chairman of the party, Elder David Ajah to undermine the interest of the party in the state. They accused Aja of bringing the party in the state to disrepute through his conducts. Aja is leading the faction of the PDP in the state that is loyal to Senator Ekweremadu. In a letter signed by the 12 members and addressed to the National Chairman of the party Adamu Muazu, they distanced themselves from all the actions taken by Elder Aja in respect of the non-conduct of ward congresses in the state on November 1. They observed that the decisions of Aja were staged and unilateral and did not have the backing of the SWC of the party. They maintained that no ward congress of the PDP was held in Enugu State on November 1, as scheduled in the party’s time -table of activities that would culminate to the primaries due to non-arrival of the electoral materials and members of the National Ward Electoral Committee to the state party secretariat at No. 1 Chime Lane, GRA, Enugu. The members of the SWC told the party leadership that all the members of the committee except Elder Aja were present through out the day at state secretariat, Enugu waiting for the materials and panel members to no avail. They, however expressed dismay “that Aja to the chagrin of the members of the State Working Committee (SWC) and other members of our great party, unilaterally addressed the press and made radio announcements to the effect that he purportedly led the state PDP executives to what he called “successful ward congress in 266 wards of Enugu State’ when infact, there are only 260 electoral wards in the state, without any approval or deliberation on the matter by the State Working Committee of the party”. They accused Aja of playing out the script of an interested member of the party in the state by unilaterally and unlawfully taking party decisions without adhering to the PDP’s constitution, which empowers the state working committee to undertake the day-to-day administration of the party in the state on behalf of the state Executive Committee (SEC). The members also disclosed in the letter that “the PDP registers fundamentally needed for the ward congresses were under the custody of our ward chairmen in all the 260 electoral wards in the state throughout Saturday , the first day of November, 2014, as they waited in vain for the congresses that never took place”. They therefore, requested the national leadership of the party to call Elder Aja to order and also take appropriate action to ensure that proper ward congresses are conducted in Enugu state in accordance with the party’s constitution and guidelines in order not to encourage impunity, illegality and insubordination in the administration of the party at any level. It is however, not surprising why the 12 members of State Working Committee who are in Governor Chime’s faction did not want Aja to continue as the Acting Chairman of the PDP in the state. 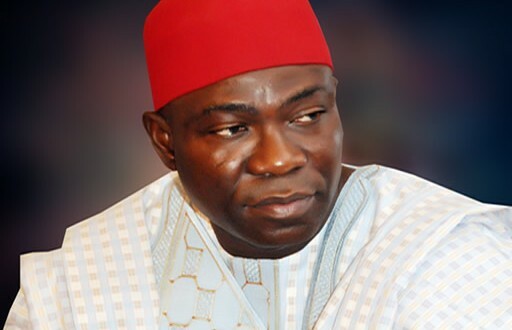 Elder Aja who hails from Aninri Local Government Area, with Ekweremadu is believed to be playing the Deputy Senate President’s script, and in that regard the governor and his camp would do anything humanly possible to remove him form office. With Aja in the saddle as the PDP chair, it is obvious that all the endorsed aspirants in the governor’s camp would lose at the PDP primaries slated for December. It could be recalled that recently Chime’s faction of the PDP was allegedly to be making an arrangement to defect to the All Progressive Grand Alliance (APGA) if their candidates lose at the PDP primaries. But in its reaction, the party dismissed as untrue the allegation that it “might be planning to pitch its tent with APGA to further its political ambition,” adding that it was the handiwork of mischief makers, who don’t wish PDP well in the state. Reacting to the news publication in some sections of the media that most campaign posters of Hon Ifeanyi Ugwuanyi pasted all over the Enugu metropolis had no PDP logo on them, the party through a statement signed by its state Publicity Secretary Dr. Okey Eze, debunked the allegation, stressing that virtually all the posters produced by its aspirants in the state had the party’s logo on them, wondering where the fictitious report emanated from. On the allegation that the consensus governorship candidate of the party, Hon. Ugwuanyi’s posters have no PDP logo on them, as an indication that the party may dump PDP for APGA, Dr. Eze dismissed the insinuation as false and misleading, stating that the said posters under reference were the handiwork of the opposition and noted that since Ugwuanyi, emerged, the elements have been trying to blackmail him but have failed. He stated that the numerous billboards dotting the state in support of his candidature have all the PDP logo. The party restated its earlier clarifications that Hon. Ugwuanyi is not an anointed candidate of Governor Sullivan Chime, emphasizing that he (Ugwuanyi) emerged the party’s consensus candidate through a democratic process that was duly endorsed by all the caucuses of the party in the state. He maintained that no amount of intimidation, blackmail, falsehood and propaganda would deter it from concentrating on the onerous assignment of delivery its candidates in the 2015 general elections. Next: STARTLING REVEALATIONS OF THE IMPERSONATION AND FRAUDULENT ACTIVITIES OF PEOPLE ON FACEBOOK AND SOCIAL MEDIA WITH THE NAME OF FR. MBAKA. ADORERS RISE UP.